Habit: Perennial herb; caudex thick, branched to not. Stem: 1--few, ascending to erect, branched to not, scapose to not, glabrous to glandular-hairy. Leaf: basal 1--3-ternate, petiole generally long; cauline 0--few, generally much reduced, deeply 3-lobed to 1--2-ternate, petiole short to +- 0; segments generally wedge-shaped to obovate, abaxially pale green to glaucous, adaxially green to gray, glabrous to glandular. Inflorescence: few-flowered raceme or flower 1, terminal; axis, pedicels glabrous to glandular; flowers generally nodding. Flower: sepals 5, petal-like, spreading [to +- reflexed]; petals 5, spurs between sepals, mouths < to > 90° to exposed filaments; pistils generally 5. Fruit: follicle, glabrous to glandular. Seed: smooth, shiny, brown to black. Species In Genus: +- 70 species: temperate North America, Eurasia. Etymology: (Perhaps Latin: eagle, from spurs, or water-drawer, from habitats) Note: Many species, hybrids cultivated as ornamental; natural hybrids common; recent adaptive radiation with specialized pollinations syndromes (bee, hummingbird, hawkmoth). Habit: Plant 20--80(150) cm, glabrous, glaucous at least proximally. Leaf: basal, lower cauline generally 2-ternate, petioles 5--30(40) cm, leaflets 7--45(130) mm; upper cauline generally simple to deeply 3-lobed. Flower: sepals 10--20(25) mm, red; petal blade 0 or 1--7 mm, yellow, spur 12--23 mm, red, tip 1.5--4 mm wide, mouth <= 90° to exposed filaments, 4--6 mm wide, +- round; stamens 10--18 mm. Fruit: 15--28 mm, beak 9--12 mm. Chromosomes: 2n=14. Ecology: Streambanks, seeps, moist places, chaparral, oak woodland, mixed-evergreen or conifer forests; Elevation: < 3300 m. Bioregional Distribution: CA-FP (exc GV, SCo, ChI), GB; Distribution Outside California: to Alaska, Montana, Baja California. Flowering Time: Apr--Sep Note: Generally hummingbird-pollinated; leaf, petal blade variation needs study. 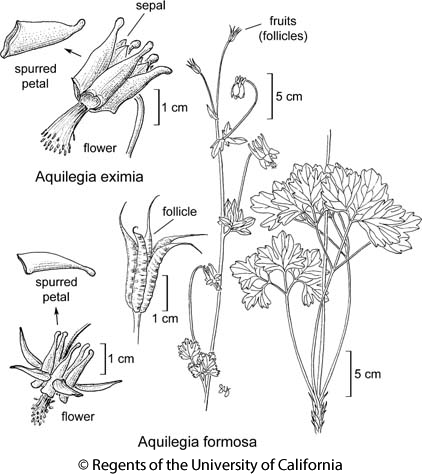 Citation for this treatment: Justen Whittall, Scott A. Hodges & Dieter H. Wilken 2012, Aquilegia formosa, in Jepson Flora Project (eds.) Jepson eFlora, http://ucjeps.berkeley.edu/eflora/eflora_display.php?tid=13668, accessed on April 19, 2019. CA-FP (exc GV, SCo, ChI), GB; Markers link to CCH specimen records. Yellow markers indicate records that may provide evidence for eFlora range revision or may have georeferencing or identification issues. Purple markers indicate specimens collected from a garden, greenhouse, or other non-wild location.